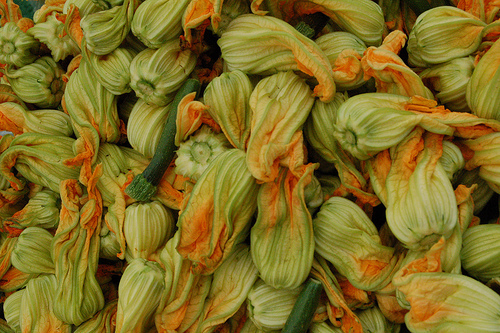 Inspect squash blossoms; don’t get them wet, but check inside for bugs and dirt. Open them gently, as they are fragile. If dirty, brush with a soft pastry brush, and remove any insects. Set aside. Mix goat cheese with a tablespoon of olive oil and a little of the freshly chopped herbs of your choice; thyme is especially nice, and one or two others. Add garlic if you want, finely minced or pressed. Using a narrow teaspoon or a pastry bag, place about 1 tablespoon of goat cheese (less if blossoms are small) inside each squash blossom. Close blossom. Brush each with a little olive oil and place on a parchment-lined baking sheet. Set aside. Make a sauce of the tomatoes, with the tomatoes finely chopped (including their juice), a little olive oil, more fresh herbs, salt, pepper, and garlic to taste. Set aside; this will taste better if it marinates for an hour, covered. Broil the squash blossoms for three to five minutes, until the edges of the blossoms are a little browned and crisp and the cheese is soft and just beginning to melt. Serve immediately, topped with a tablespoon or two of the tomato sauce. Nice with thin slices of crusty bread. Adapted from Follow Your Heart Cookbook: Recipes from the Vegetarian Restaurant by Janice Cook Knight, Wiley, 2005.